The X-Trail is perfect as an on- and off-road vehicle and has plenty of space for the family and all their gear. This car is well built and designed to be powerful yet easy to control whether on or off the road. It has a spacious cabin, with space for five and great spacious cargo area everyone can use. You can enjoy advanced safety features and custom luxury options that make the ride even more enjoyable. 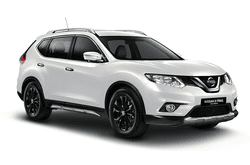 The Nissan X-Trail gets great mileage and is a fuel- efficient vehicle which is important to many drivers these days. Get yours reserved today while it is still available because they are in high demand!